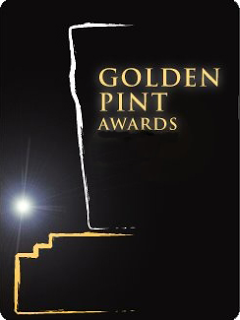 With 2012 in the Common Era almost over, I'm finally having a stab at the Golden Pints. This is a set of beery awards instituted by writers Andy Mogg and Mark Dredge; the idea is that anyone who wants to do so can offer their list, Mark then compiles a “best of” listing on his blog – I hope there will be an update to his initial posting here from 10th December! The list starts with several standard categories, then we're free to add categories of our own as we wish – non-UK writers are invited to substitute their own location for “UK”; as I'm both, I'll add categories for Germany. 1. Windsor & Eton Conqueror 1075 – all the Conqueror variants are superb, but I was lucky enough to catch the full-strength one on cask when it's normally only available in bottles. In bottle it's great, in cask and well-kept, it's stunning. 2. Thornbridge Bracia (Pedro Ximénez Aged) – I'm going to be strict here and only vote for beers I drank during 2012. This eliminates some of my favourites as they're seasonal and I wasn't in the country at the right time. This was one where I was in the right place and time – and fortunately had enough cash on me, as it was £12 a pint! 1. The Kernel Export Stout London 1890 – Evin's historical beers are just so complex and wonderful, especially the Stouts. 2. Fullers Vintage Ale 1999 – all the Vintage Ales are great, and usually more so with a few years on them, it so happens that this 13 year-old was the one I enjoyed this year. 3. The Kernel Imperial Brown Stout London 1856. This is a tough one, because finding anything other than (boring) Pils or Weizen on draught is tough, except in places with local specialities such as Rauchbier and Braunbier in Bamberg, maybe Märzen in Munich, or Kölsch in Cologne. 1. Klindworths Sauensieker Pale Ale – where most German brewpubs' output is pretty staid, these guys like to have fun. Their take on an English Pale Ale is a bit of a hop-bomb, yet malty and well balanced. 2. Paffgen Kölsch – on tap at the tap. Fresh beer is not always best, but this was one time when it was – well, as fresh as lagered beer can be. 3. Maisels Dampfbier – one of the few darker beers I can get regularly on draught, this Steambeer is a lovely example of a Franconian amber ale. If I wasn't pulling them out separately, I'd quite possibly not have any German bottled beer in here at all. There's a lot of good German beer and some very good German beer, but I've not found a lot of really really good German beer yet. Some brewers are starting to experiment with different flavours and so on, but quite cautiously so far. 1. Kyritzer Mord und Totschlag – from a North German abbey brewery that's done a number of recreations of medieval dark beers, this one's a smoked black-beer from the 1700s. 2. Weltenburger Kloster Asam Bock – one of the classic Doppelbocks, rich and sweet, yet roasty and burnt. 3. Propeller Nachtflug - that rare beast, a German Imperial Stout, it's rich, dry, roasty and slightly salty (and no, it doesn't have double-headed eagles on the label!). Andechser and Einbecker would both be in here as absolute classics, along with Störtebeker Stark-Bier, except I'm being even more strict in this section, and listing only beers that were new to me this year. 1. Emelisse Imperial Russian Stout – as black as sin, and almost as tasty. 2. Southern Tier Choklat – a superb Stout made with cocoa. 3. Evil Twin Yin – UK or not? I'll say not as it's a Danish brew, even though the brewing apparently took place at Brewdog. It's black and thick as liquorice, and as tasty as the best bits of coffee, port, liquorice and treacle toffee, all rolled together. W&E Conqueror 1075 – I've been doing some thinking and reading around Black IPA, as well as discussing it with beer historians, and I've come to suspect that it is a genuine historical style, but with the wrong name. Everyone knows the story of IPA, that it was shipped to India for the troops – well, no it wasn't. IPA was shipped to India for the officers and gentry – the troops got Porter. Indeed, Ron Pattinson's research suggests Porter shipments to India were more than double those of IPA – and that Export India Porter was a hopped-up 1800s Porter at around 7-8%. Not far off a Double Black IPA, eh? Magic Rock – for consistency, variety and fun. OK, so none of their beers made it into my top three individually, but Magic Rock's average is significantly above almost any other UK brewery working today. Klindworths, I must go and visit them soon! Alvinne, for great beer and also for the Alvinne Craft Beer Festival. It's a bit of a zoo, but as a bar and for craft keg I still like the Euston Tap. For cask ale and a proper pub experience, it's my London local, the Magpie & Crown in Brentford. Another tough one. It was great to have GBBF back at Olympia this year, and I enjoyed working at the Twickenham beer festival too, but for the variety of both people and beer I think it has to be the Alvinne Craft Beer Festival. OK, this is a beer supermarket, but all the branches of Hol'Ab I've used have impressed me. Like most German drinks shops there's crates and crates of boring Pils, but there's usually a whole wall lined with unusual stuff as well, a lot from Franconia and Bavaria-proper but also some others too. Don't expect to find much foreign beer though, unless you're desperate for Guinness or Heineken, or are a gastarbeiter needing Tyskie or Lech for a taste of home. Bierland in Hamburg, for a great selection of hard-to-find German beers, plus a sprinkling of decent foreign stuff. 1. Shut Up About Barclay Perkins – more beer history than you can shake a stick at, the dry numbers amply counterbalanced by Ron Pattinson's erudition and dry wit. 2. Pete Brown's BeerBlog – great writing. 3. Boak and Bailey – almost always thought-provoking. The London City of Beer launch at the Red Herring, in particular Fuller's Bengal Lancer with a variety of cheeses. I should try more IPA/cheese pairings. Get more beer writing gigs, lead more guided tastings, get to the European Beer Bloggers Conference again, and generally get to more beer events. Dear gods, I'm already over 1300 words – no wonder this has taken days to research and write... Merry Yule and Frohe Weihnachten, everyone!